To Functional Linguistics (from which Jakobson is an exponent) language is a functional system product of human activity and its purpose is the realization of the individual's intention to express and communicate. Jakobson’s contribution from linguistics and language functions that he develops, manifest the communicative richness of language itself. Any speech says a lot more things than it appears to enunciate at first instance. Through language we persuade, we establish social ties; we build our own realities, etc. Its approach realizes coincidences and convergences between the most recent stages of methodology of linguistic analysis and the way in which language is considered in the Mathematical Theory of Information, from the analysis of a set of shared concepts: redundancy, information, code, semantic noise. However, despite this mutual collaboration, communication research from linguistic has other objectives, among which there is language being considered as the basis of culture and a communication tool. Jakobson’s contribution communication models is embodied in his famous article “Linguistic and Poetics”, published in 1960, in the Style in Language work, directed by T. A. Sebeok and edited by MIT Press. 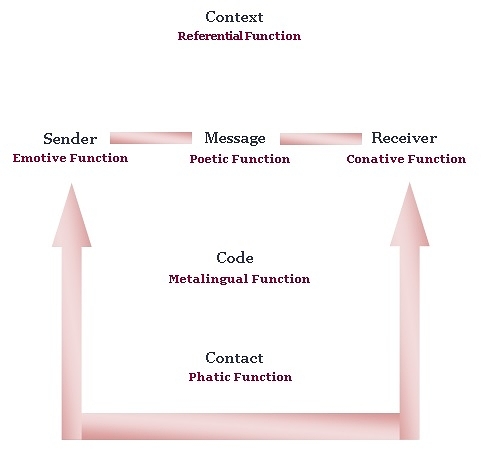 There Jakobson proposes to investigate language's functions and the first step before establishing them is to create a communication model, that is why it's called “About Communication Factors and Language’s Functions” (See Chart): the sender sends a message to the receiver. This message has a referential context which the recipient can grasp. It is also necessary that sender and receiver share a common code, by which the first one modifies the message and the second one decodes it. The last element is contact, which for Jakobson is a physical channel and a psychological connection between sender and receiver, which allows both of them to establish and maintain a communication. The importance of Jakobson’s model lies in, despite the influence of the Mathematical Theory of Communication, no longer considering the message as a mere transmission of information. Authors / References: Roman Jakobson.